This cutie is a MUST for your holiday decorating. Gingerbread boy would look great as part of your holiday décor and just think how perfect he would be at your holiday party!! 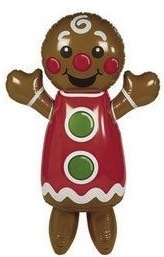 You don’t find these inflatable Jumbo size Gingerbread decorations everyday so please hurry and visit here to get yours.